While having dinner at a café/bar called ‘Enjoy’ which has cool swings at the bar, we had a chat with a local captain called Steve about a possible snorkelling trip. Deciding we were all keen, the 7 of us booked on for the following day. At 9.30 we were down at Scoober Steve’s ‘Blackhawks’ office, decking ourselves out in our snorkelling gear. We had seen a really fancy boat moored up at the split the previous day and I think we all (well, definitely me and Kim) had dreams that she would be our vessel for the day. Dreams which came crashing down pretty quickly when we spied our more rustic, but sea worthy stead. We were joined by 1st mate Vic, and a few other tourists before we set sail for our first stop. 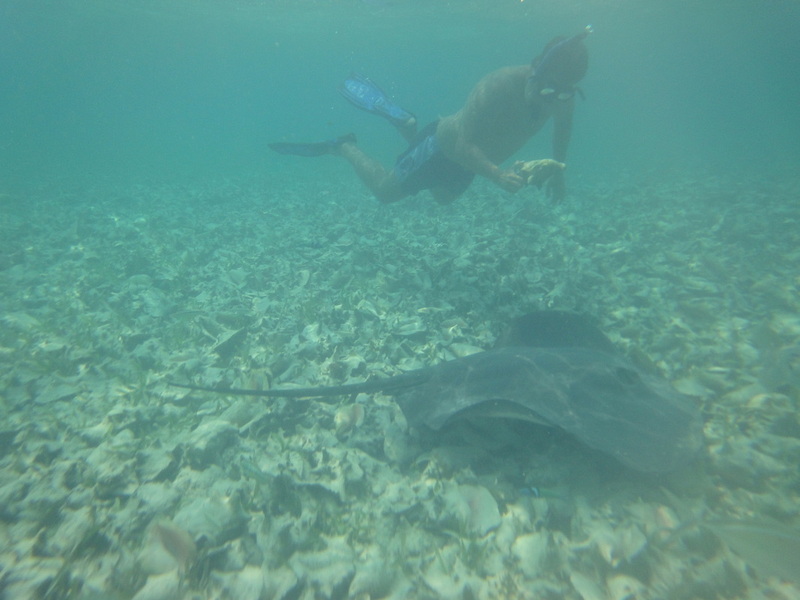 During July, Manatees (sea cows) can be spotted daily along the Caye Caulker coast. Sometimes in the months surrounding you are lucky enough to see one. We weren’t. But the rest of the day more than made up for it. 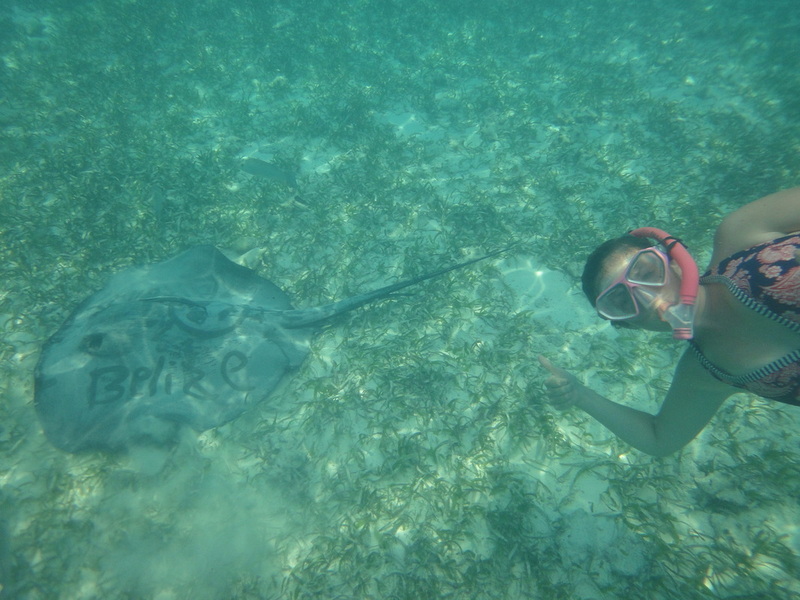 Our first stop was at Shark and Ray Alley. 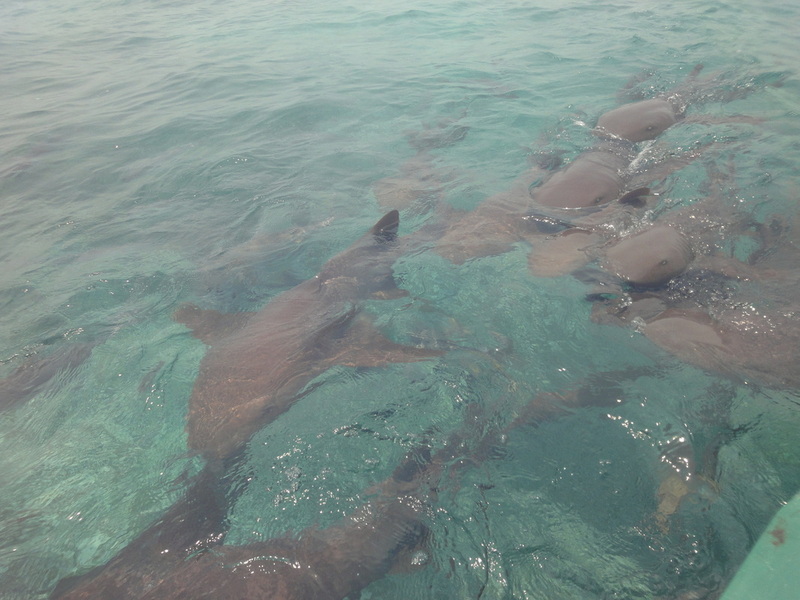 Hundreds of Nurse Sharks and sting rays live in the area and despite our initial nervousness about getting in the water with them, they are pretty docile and we were able to get really close to them and touch them. After about 40 minutes in the water, we were back on the boat enjoying delicious bananas and pineapple to boost our energy levels. The next shop was called ‘The Swash’, although the more tourist friendly name is apparently ‘ Coral Reef’. This stop absolutely blew my mind! For the last few decades the local fisherman have gone out to this area to clean out their conch shells at the end of the day, before throwing the shells overboard. As the shells accumulated, they began to form a coral reef in the area. 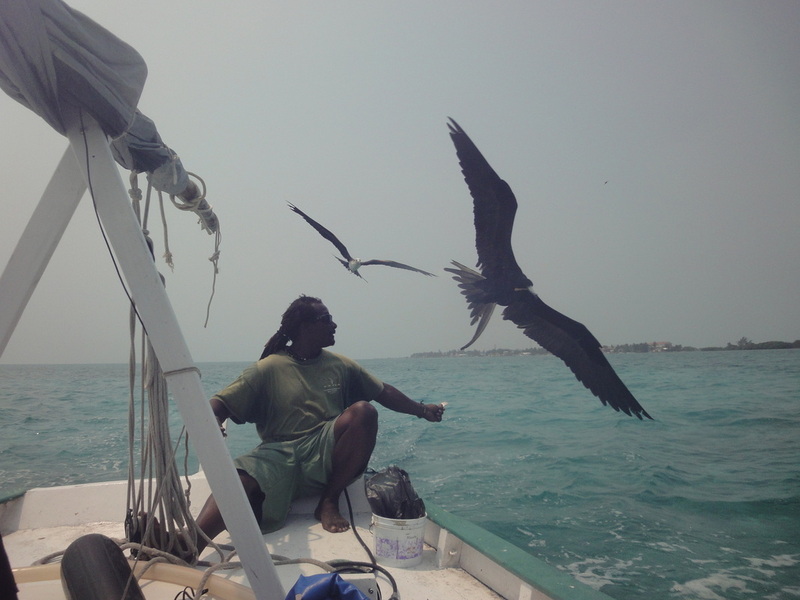 The fisherman lobbied the government and the area is now a protected marine reserve and the fisherman look out for the animals who live within it. 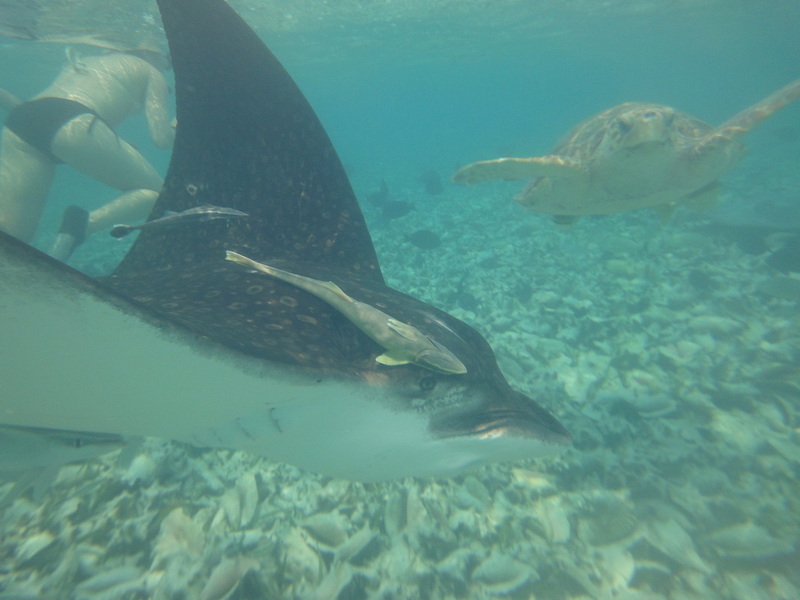 Because the fishermen have always thrown their seafood scraps into the water here, it has attracted an abundance of wildlife, and we got extremely up close and personal with turtles, sting rays, manta rays, as well as various other colourful fish. It was amazing! Everything swims within inches of you, and it is often hard to get out of their way in time. 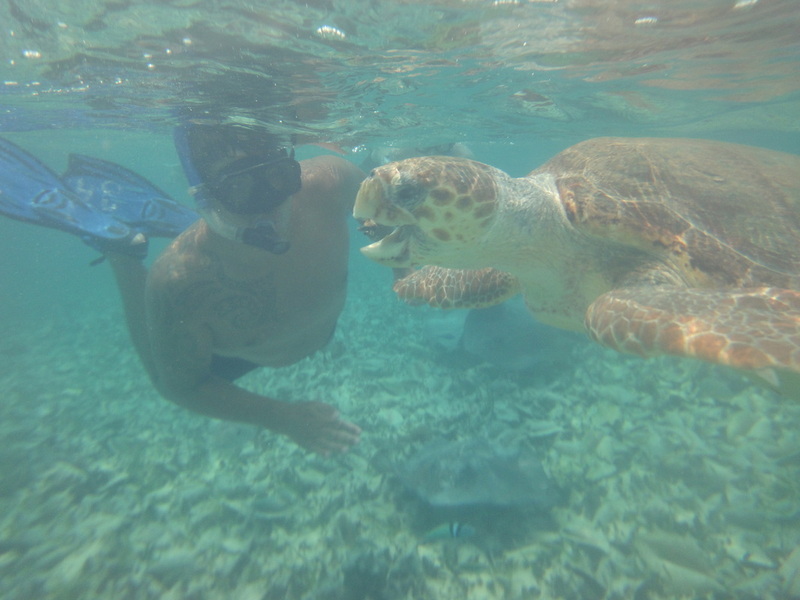 Ty managed to grab a bit of fish thrown overboard and hand fed one of the turtles. So, so, so fricking cool! After such an epic experience I was a bit disappointed with our last stop, the centre of Hol Chan Marine Reserve. 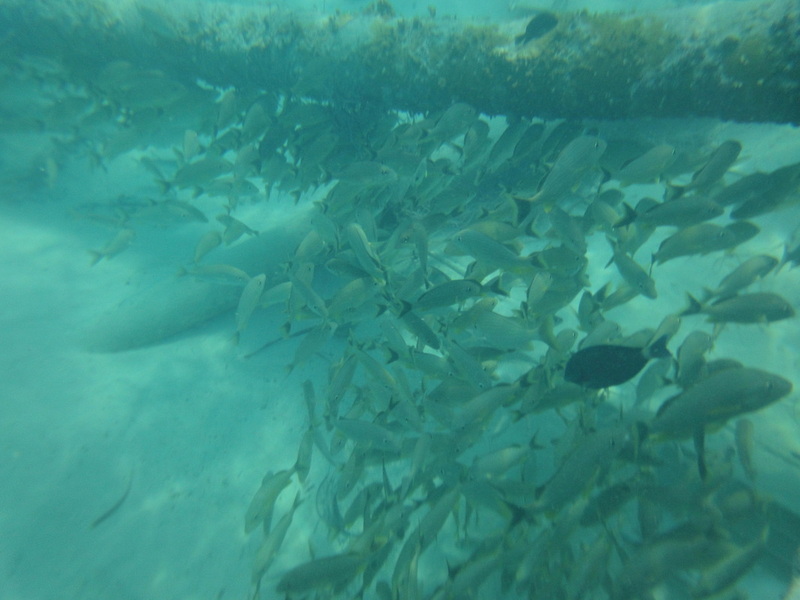 Had it been the first stop on our day it would have been really cool, as we snorkelled around the reef, seeing colourful fish, barracudas, other big ones which I have no idea what they are called, and Ty even spied a moray eel. But because of the very strong tides that day we were unable to go into the split in the reef so we didn’t see as much as anticipated. I am glad that our captain told us though, as we spotted a group of stranded tourists on our way out. Vic replenished us on our way back to land with freshly made ceviche, and some delicious, but super strong rum punch. The hotel owner told us that to get to Caye Caulker from Corozal the first boat would take 2 and a half hours to San Pedro and then another hour boat ride from there to Caye Caulker. Originally I thought it would be fun to island hop our way south, but Belize is a lot more expensive than I had anticipated, so on his advice and his calculations we decided instead we would hop on a chicken bus (which actually had chickens on it!) down to Belize City, and then the direct ferry up from there. Even though it felt counter-intuitive to go south only to go north again, it probably saved us about $50 and took a bit less, if not the same, amount of time. The other thing that swayed us was the really choppy water. 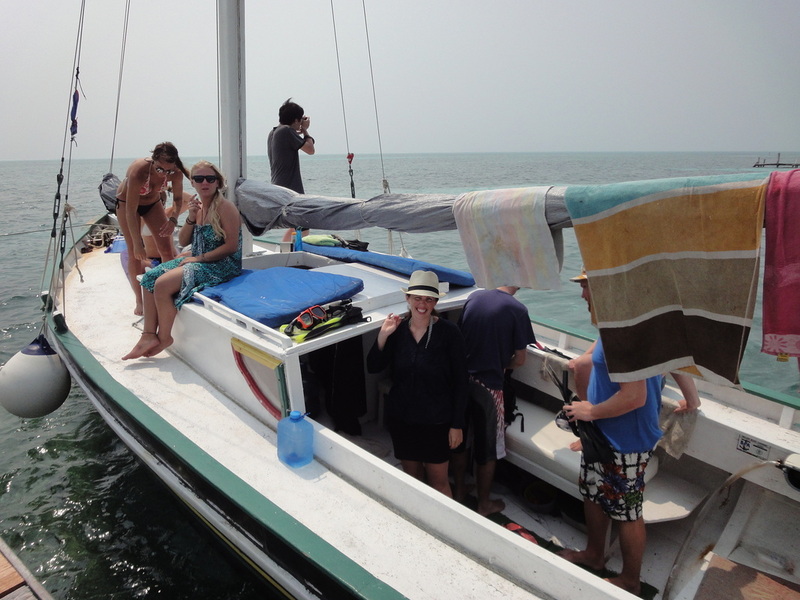 45 minutes on the boat from Belize City was enough, even with our extremely good captain, so I’m glad we didn’t need to spend 3 ½ hours sailing that day. Arriving on the island we headed straight to the closest hostel ‘Yuma’ and managed to get the last 2 beds. Prime real estate right next to the boat dock means they are full year round. Wandering around the island it didn’t take us long to get into the ‘Go Slow’ state of mind that the locals adopt. Caye Caulker has a fantastic laid back atmosphere, with golf carts and bikes being main mode of transport. After a night at the open air movie watching Django Unchained we tucked ourselves in, lulled to sleep by the waters lapping on the shore. Unfortuantely because the hostel is one of the most popular its also one of the noisiest so the next morning we went for a leisurely wander around the island checking out other places to stay. We ended up at “Dirty McNasty’s” (a former whorehouse! ), as for 50c more than our first hostel they gave us breakfast and free bikes. They aren’t currently in Lonely Planet either which meant that they were less busy but a definite gem of a find! The next 4 days were spent blissfully in Go Slow mode – sleeping, swimming, eating and drinking. There are no ‘beaches’ per say on Caulker. In 1961 a hurricane broke the island in two and the area known as the ‘Split’ is where most people head to relax and swim. We made friends with a lovely Irish couple – Kim and Barry – who have done our trip in reverse and are on their way to New Zealand, their English travel buddy Mat, and a couple of guys from our dorm room – Julian and Pali, who all became our partners in (relaxed) crime for the next few days. 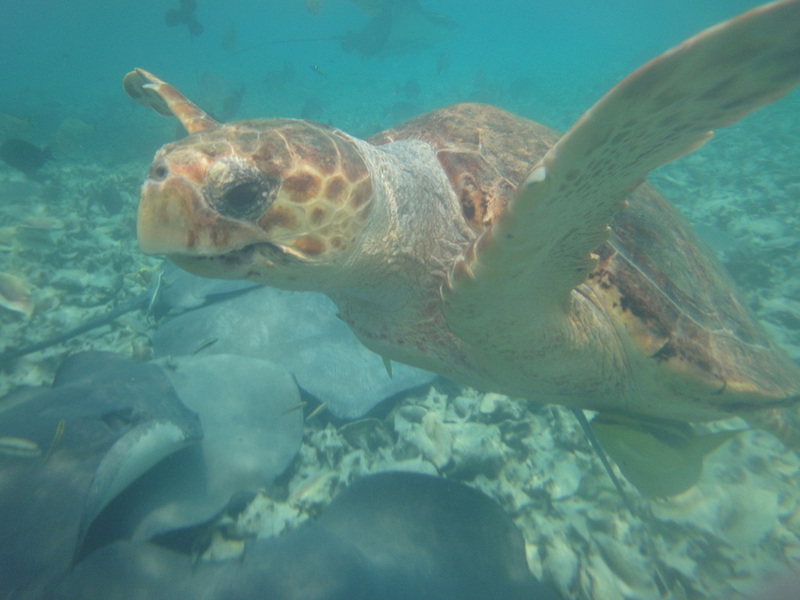 We all decided to spend one day on an adventure with Capt'n Scoober Steve to the Hol Chan Marine Reserve (blogs coming tomorrow!) where we spent an amazing day getting up close and personal and snorkelling with sharks, mantarays, turtles, sting rays and other reef life, making good use of our new underwater camera case. Back at the hostel, Ty put all the photos on our computer to look at them, before heading to bed. When I woke up the next morning I turned our laptop on, only to be met with the blue screen of death! OH NO! Gutted that we had lost all of our photos from the previous couple of days, we tried to find someone on the island who could help us work out the problem but no one was available. Julian took a quick look and thought it was a hard drive problem but couldn’t fix it so we packed it away with sad faces. A day or two later though and Ty decided to give it another go and waddya know – she came back to life! YAY! First job was to get all our photos backed up onto our hard drive! On our final night we headed down to the local sports bar for quiz night. Despite a controversial answer (since when does ‘Prague’ rhyme with the word ‘Cog’) we still managed to finish second, winning ourselves a big jug of rum punch! The kind of day that makes you appreciate the really good days! After hearing conflicting information from lots of backpackers about whether or not we needed to pay a departure tax when crossing into Belize, we spent an hour or so researching it before we left Bacalar. All information seemed to point towards the fact that there is a $25USD departure tax which only needs to be paid if you are departing Mexico by air. Arriving at the border by collective, surprise surprise, the guy asked us for our $25. Knowing that if we paid him, it would go directly into his pocket we refused and argued our case. Refusing to let us pass he sent us back into the border town (25 minutes away) of Chetumal, with instructions that we needed to pay at any of the banks in town. Arriving at the bus station, we asked around for the closest bank, only to find out that the bus station is on the outside of town and we needed to pay for a taxi back to the centre. To save lugging our backpacks around town we decided that Ty would stay with them at the bus station and I would go into town and sort out the paperwork. We had heard that the departure fee by air could be paid at a bank so despite believing that we were in the right and didn’t need to pay for our land border crossing at least the money wasn’t going into his pocket. Arriving at the bank, using my bumbling Spanish I made my request to pay the fee. After some back and forwarding I came to understand that they didn’t have the right form that they needed to give me the receipt. After much deliberation amongst themselves they said that I needed to visit what was effectively the social security office, to get a copy of the form, and then come back to them. Not wanting to waste money on another taxi ride, I crossed the street to the only other bank I could see only to find that they didn’t have the ability to process my fee either. Using the directions provided I hailed a cab to the social security office, only to be accosted by the taxi driver. Lifting his t-shirt to show me a large lump on his stomach and some surgery scars he tried to guilt trip me into giving him money to pay for medicine. I had no cash on me to give him anything had I wanted to, but I resented the uncomfortable situation he put me in. As soon as he drew to a halt outside the building I swiftly made my exit. After a frustrating 25minutes at the social security office, me trying to explain exactly what I needed the form for, and them trying to find the right one, only to discover that the form we needed is held at the immigration office. At the border. Are you fricking serious?!!?!? Not wanting to waste more money on another taxi, I used the frustrated pent up energy I had to walk back to town. Finally managing to get cash out from the third ATM I tried I headed back to the bus station to Ty, and onto a bus back to the border. 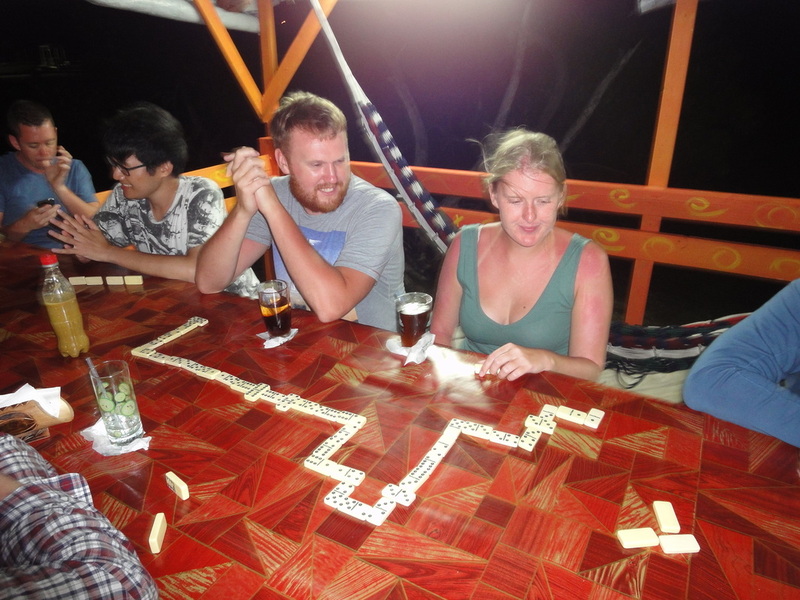 We decided for the sake of ease that we would book a bus the whole way through to Corozal (Belize). Back at the border with our old friend, and he tried to send us back to the town again, or possibly somewhere around the corner. Telling the bus driver we needed him to wait, he decided to come and help us out. After plenty of backwards and forwarding I threw my hands in the air and told Ty to just pay the man. 296 peso became 300 – of course he had no change! Despite hating the fact that I knew we were paying his pocket and not wanting to become part of the problem of him thinking he could get away with it, after 4 hours of being messed around I resolved that I next time we would just save ourselves the time and hassle and give in. 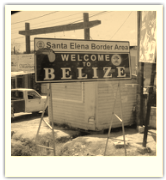 Finally we were on our way - through the ‘free zone’ – effectively 5km of duty free – and across the Belize border with no problems. The guy at the customs stand was pretty taken with all the patches on our bag and made us promise we would get a Belize one to sew on there as well. We chose Corozal as our first point in Belize as according to Lonely Planet there were 2 boats a day from there to the island of San Pedro, from where we could get another boat down to Caye Caulker. We had seen friends photos of the island and decided it was a must see on our itinerary. Arriving into the sleepy, dusty town we found that due to a boat being established directly from Chetumal (in Mexico) there is now a lack of tourists coming through Corozal and the boat only runs once a day. Resigned to stay the night, we walked 2.5km in the hot afternoon sun with our packs on our backs to the one and only hostel on the outskirts town. To find that it had closed down. And none of the neighbours in the area knew what we were talking about. We decided to just head to the closest hotel and just spend the money and check in, but luck was not on our side today, and there was no-one there and the office was closed. After 15 minutes in the shade of their front porch, we sighed and headed back to town. Finally finding somewhere to rest for the night we plopped down on the bed and were grateful for the two big fans and the television for a couple of hours. We joined the owner of the hotel, a man who would give Basil Fawlty a run for his money, and his friend (Alfrick) for a drink at the bar – discovering that Alfrick was a fellow kiwi, although now living in Belize. We had a really nice time sitting and chatting. The owner made me a couple of delicious cocktails which I wish I could remember the name of! Essentially it was just vodka, grapefruit juice and soda water, but after the day we had had it hit the spot! Alfrick was excited to chat with other kiwis and kindly took us out for dinner to one of his favourite restaurants where I had some seriously good ceviche and we had a lovely evening hanging out with each other before saying our goodbyes.